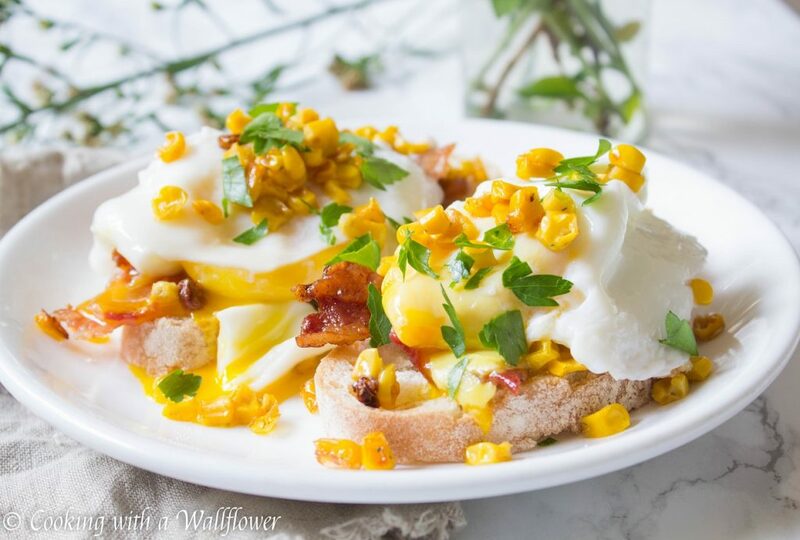 Breakfast toast topped with crispy bacon, poached eggs, and roasted corn. This roasted corn, bacon, and egg breakfast toast is exactly what I need to start my weekend mornings. In the mean time, let’s talk about Sunday brunch. This breakfast toast is what happens when you want avocado toast but don’t have any avocados at home. *sigh* We always have avocado at home, but of course, that moment when I’m desperately craving an avocado toast, we don’t have any, not even a tiny one. So I had to make do with what we do have at home. 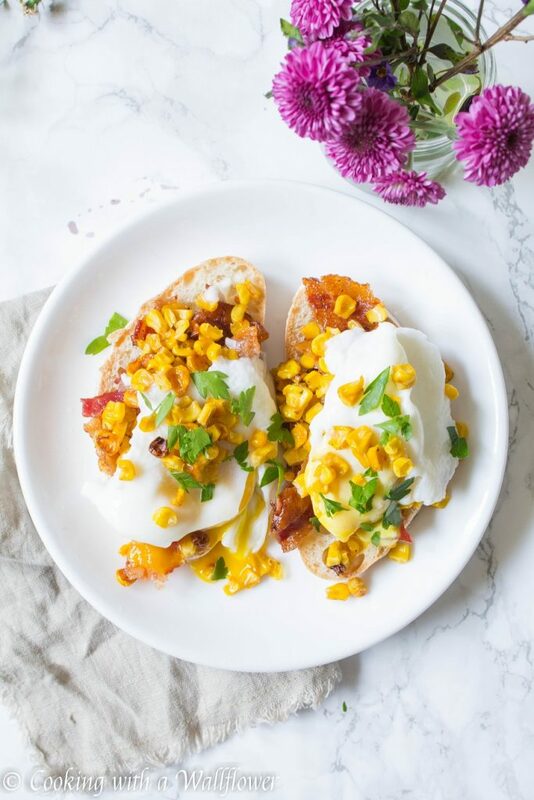 Roasted corn, crispy bacon, and poached eggs on crusty bread. But it’s definitely going to become a thing in our house because the flavor was just sooo good. 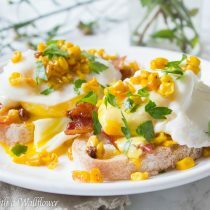 I love the addition of the roasted corn for a slightly summery twist to the classic bacon and eggs on toast. Poached eggs with the yolk oozing out from a slice down the center? Yesssss! Exactly what I need on a lazy weekend morning. Like today. So… I’ve truly converted to baking bacon in the oven instead of cooking it on the stove. All the bacon strips in a single layer on a parchment lined baking sheet and then baked at 350F for about 30 minutes. Super easy to do and less of a mess since there’s no grease splashing everywhere. And all that evenly crispy bacon strips to your desire. Once they’re done, remove the bacon from the oven and set aside for now. While you’re baking the bacon, you can also roast your corn. Drizzle olive oil on a baking sheet. Place corn kernels in a single layer. You can use fresh, frozen, or canned corn. Drizzled olive oil over the corn and a pinch of salt. Roast the corn in the oven for about 20 minutes while the bacon is baking. Once the corn is done, remove them from the oven and set them aside for now. In a small pot, heat water over medium heat. 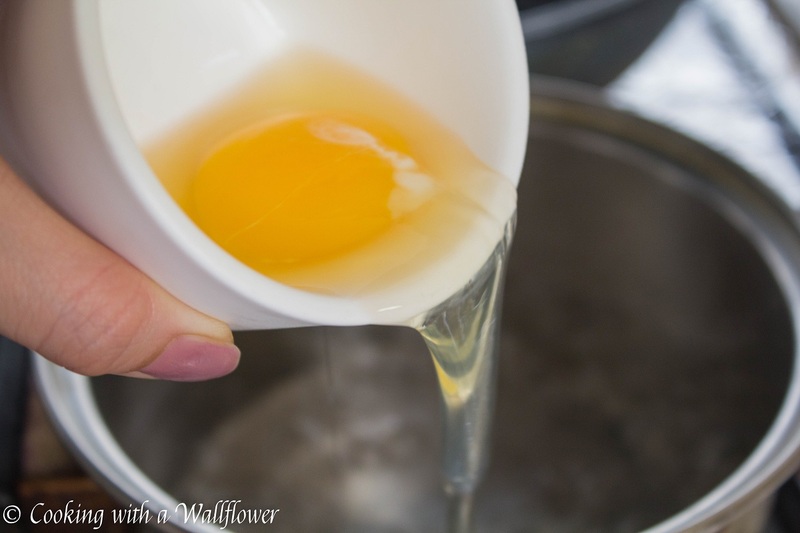 Crack an egg into a small bowl or ramekin, and gently drop the egg into simmering water. Repeat with as many eggs as you need. Let the eggs cook for about 4 minutes then use a slotted spoon or spatula to scoop the egg out of the water. Set the eggs aside for now. Toast slices of bread. 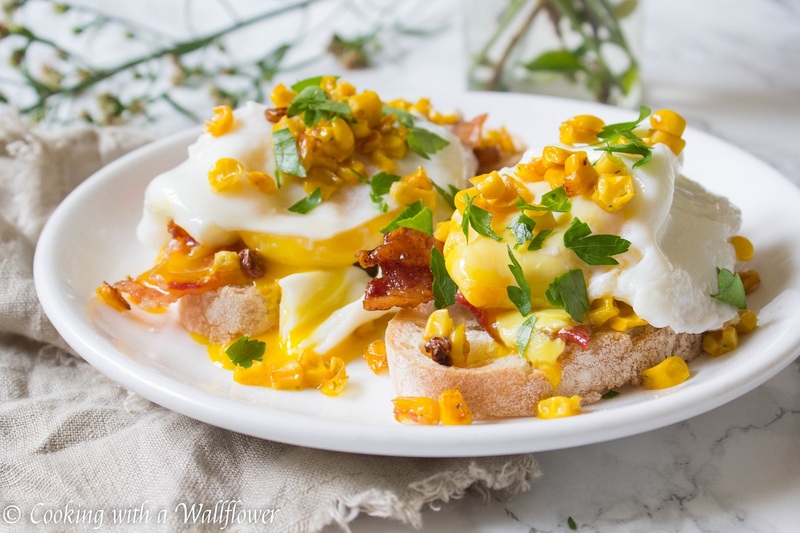 Top with strips of crispy bacon, poached eggs, and roasted corn. Sprinkle a pinch of salt on top. Garnish with finely chopped parsley. Serve the roasted corn, bacon, and egg breakfast toast warm. 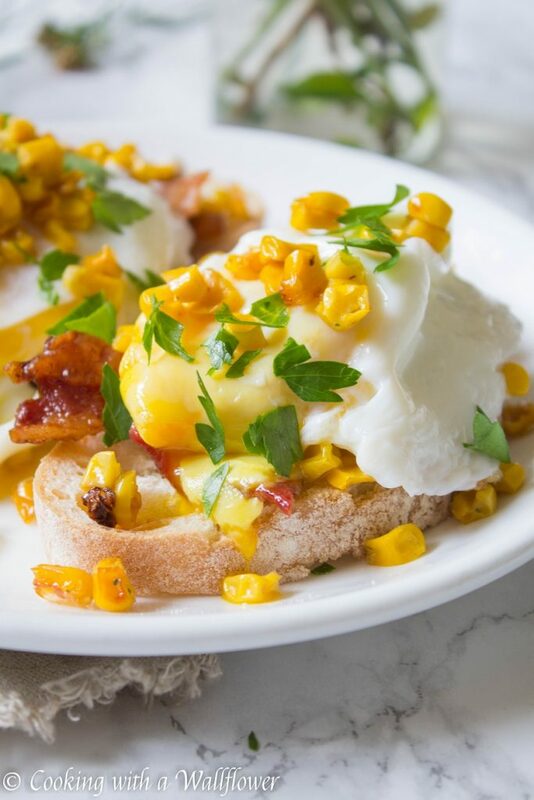 Breakfast toast topped with crispy bacon, poached eggs, and roasted corn. 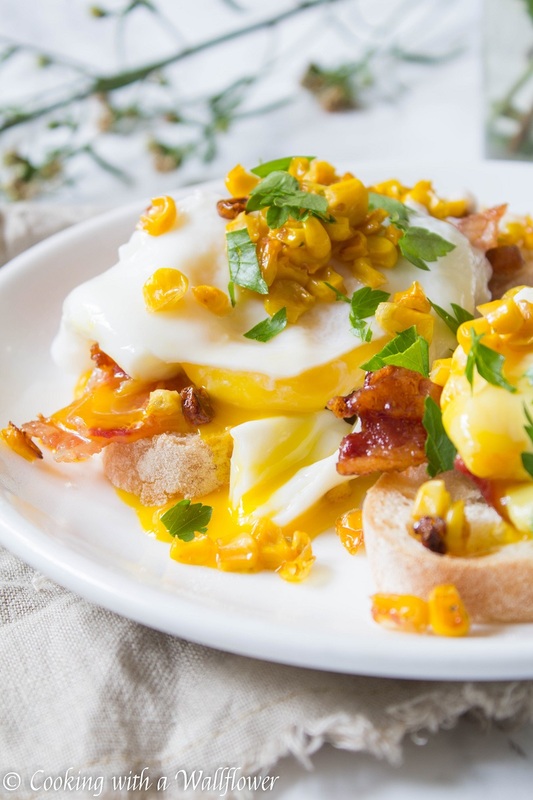 This roasted corn bacon egg breakfast toast is exactly what I need to start my weekend mornings. 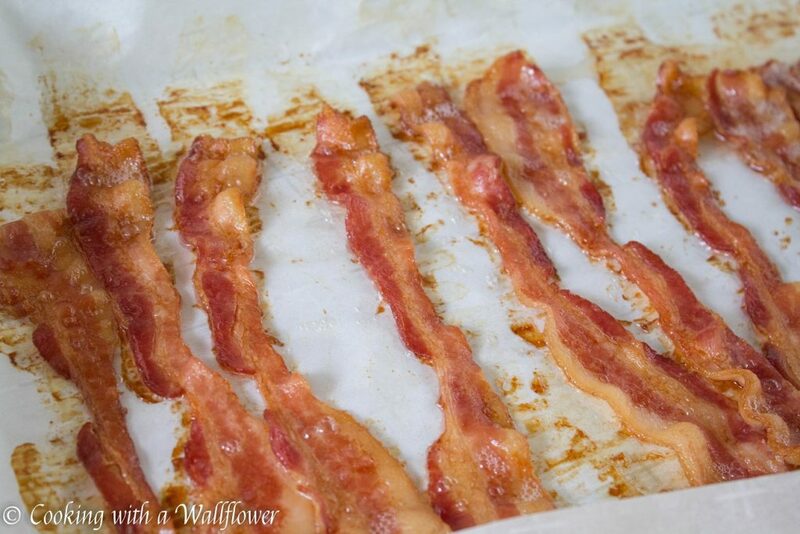 Place bacon strips in a single layer on the parchment lined baking sheet and then bake for about 30 minutes. Once they’re done, remove the bacon from the oven and set aside for now. While making the bacon, roast the corn. Drizzle olive oil on a baking sheet. Place corn kernels in a single layer. Drizzle olive oil over the corn and a pinch of salt. Roast the corn in the oven for about 20 minutes while the bacon is baking. Once the corn is done, remove them from the oven and set them aside for now. 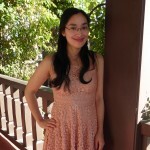 This entry was posted in Breakfast, Entree, Farmer's Market, Quick and Easy, Recipes and tagged bacon and eggs, breakfast, quick and easy, recipe, toast.